When a child is born by vaginal birth, important immune system-stimulating bacteria pass from the mother to the baby, which could explain why babies delivered by caesarean are more prone to diseases linked to the immune system. This important discovery was made by a team of researchers in a study led by FNR ATTRACT Fellow Associate Prof Dr Paul Wilmes from the LCSB at the University of Luxembourg. Human beings are born without germs, but from the moment we are born, crucial bacteria start settling around our body in places such as our lungs, our skin – and the gut. Scientists have long suspected that there is a link between this process and our health during the course of our life. 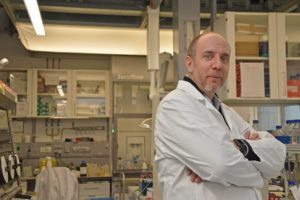 FNR ATTRACT Fellow Associate Professor Paul Wilmes, head of the Eco-Systems Biology research group at the LCSB at the University of Luxembourg, and his colleagues have now revealed evidence supporting this suspicion in a study of new-borns, of which half were delivered caesarean section. It could be that a caesarean section prevents certain bacteria – which during a vaginal birth would interact with the baby’s immune system – from being passed on from the mother to the newborn. “We find specific bacterial substances that stimulate the immune system in vaginally born babies. In contrast, the immune stimulation in caesarean children is much lower – either because the bacterial triggers are present at much lower levels, or other bacterial substances hamper these initial immune reactions to happen. The team suspects that it is possible that the immune system of the children born by caesarean takes a different path from an early stage. The trend toward delivering by caesarean, also called C-section, is rising in Europe. Luxembourg is no exception: in the Grand Duchy, 31%, almost one third of babies are delivered via caesarean section. “Of course, it is already clear that we should not intervene too strongly in the birth process. Babies should only be delivered by caesarean section when it is medically necessary. The next step is now to investigate the mechanics of this link with the aim to find ways to ‘replace’ the maternal bacterial strains that caesarean-born babies lack. This could potentially done by administering probiotics. The study involved the Luxembourg Centre for Systems Biomedicine at the University of Luxembourg, the Integrated BioBank of Luxembourg (IBBL), as well as the Centre Hospitalier de Luxembourg (CHL) and collaborators in Sweden. The study was financially supported by the grants from the FNR’s ATTRACT, CORE and AFR programmes, as well as by the Fondation André et Henriette Losch. Additional funds were provided by the University of Luxembourg. Sample collection, processing and storage were co-funded by the Integrated Biobank of Luxembourg under the Personalised Medicine Consortium Diabetes programme. The results of the study ‘Birth mode is associated with earliest strain-conferred gut microbiome functions and immunostimulatory potential’ have been published, open access, in the journal Nature Communications (DOI: 10.1038/s41467-018-07631-x).